The nature of minerals in their most elemental state is that of single atoms. Only in this state can they carry an electrical charge, positive or negative. The body can only take up these elements if they carry an electrical charge. When minerals do not have an electrical charge they are locked-up and unusable. Minerals in complex and colloidal forms are not cell ready as they are not able to be carried through the cell. We are really proud to introduce our line of Angstrom Minerals formulated by Dr. Annette Hasalone-Eve, N.D. 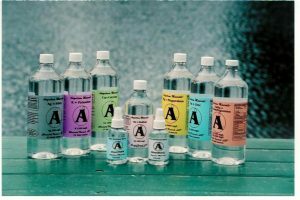 Starting off with pure, clean water that has been through reverse osmosis filtration and ozone infusion to eliminate all minerals and pathogens from the water, Angstrom Minerals are created using the highest food and technical grades of minerals. The minerals contained in the raw materials are 99.9% pure. The science behind the Angstrom Minerals technology is Dr. Annette Hasalone-Eve’s proprietary technique for maximum nutrient availability to the body. Understanding the significance of atomic mineral supplements takes a basic understanding of chemistry. Here is an example of how atomic minerals work in the digestive tract. Hydrochloric Acid is made up of primarily zinc by the body. After the food has been digested to a degree in the stomach, into a substance called Chyme, it is passed through the duodenum where the Chyme is allowed to further digest before passing further into the digestive tract. To neutralize the Hydrochloric Acid, the gallbladder, containing sodium, calls to the body for two atoms of carbon to create sodium bi-carbonate, which neutralizes the acid so that the Chyme can be further digested by the friendly bacteria in the intestine. The food is broken down into its constituent parts of atomic minerals, vitamins, amino acids, enzymes and other nutrients needed by the body. Angstrom is the smallest wavelength of light and used to describe the length of molecules and crystals. The name “Angstrom” has been used illustrate how small the particles are in their mono-atomic form. Colloids and complex minerals are all in particle size of approximately a micron. A normal human strand of hair is approximately 50 microns thick. By comparison an angstrom is 10,000 times smaller than a micron, or approximately 500,000 times smaller than the thickness of a human strand of hair. The nature of minerals in their most elemental state is that of single atoms. Only in this state can they carry an electrical charge, positive or negative. The body can only take up these elements if they carry an electrical charge. When minerals do not have an electrical charge they are locked-up and unusable. Minerals in complex and colloidal forms are not cell ready as they are not able to be carried through the cell. The cell is much to small to allow the micron to enter. It would be like attempting to fit a basketball inside of a B’B. As a matter of point, complex minerals are more than likely causing more harm than good. Complex minerals are those like Calcium Carbonate, one calcium atom and three carbon atoms. They are bound tightly together and useless for the body. Molecular bonds the body recognizes and can break apart are the loose bonds found in plants, providing that the body has a functional digestive tract. Many people today do not. Elements that are a must for all cells and tissues are Hydrogen and Oxygen, and these two elements are essential to carry nutrients into the cells. Hydrogen and Oxygen when molecularly bound are known as water. Water molecules contain one oxygen atom and two hydrogen atoms. The water molecule attracts through its charges various minerals, yet one water molecule can carry only one nutrient at a time. Our bodies need minerals in their atomic form so that it may create the various substances it needs to properly function. In a real sense our bodies are a living chemistry laboratory. Dr. Linus Pauling said, “without minerals, vitamins are useless”. Vitamins, Hormones, Amino Acids, and Enzymes are all activated by minerals. Follow an amino acid down to its atomic structure and you find minerals, for example some amino acids are sulfur based. Enzymes, such as super oxidase dismutase is supported by zinc, iron, copper, and manganese. Vitamins are the supervisors of the construction crew. Amino Acids and Enzymes are the workers in the hard hats. Minerals are the materials used for all construction. Calcium, Magnesium, Manganese and Phosphorus make up the foundation of our skeletal structure. Your heart is a pump with Potassium fuel sitting in an electrically reactive solution with sodium which provides the charge for your heart to beat. As you can see minerals are essential to health and need to be supplied to the body in the proper form. With the depleted soils that cause depleted plant and animal food sources we are not getting the nutrients we need from our food. Anti-nutrients like preservatives, additives, toxins, soda pop, processed foods, pesticides, herbicides, etc. are stripping our bodies of nutrients which further necessitates the supplementation of minerals. Supplementation of minerals to replace what is missing or being stripped out of the body has become essential for our health. *Cell Ready = assimilated into the human cell, not just the blood stream. Ionic = possesses an electrical charge. Water-Soluble = mineral angstrom sized particles in an aqueous solution. The information on this page has been extracted from copyrighted material written and provided by Dr. Annette Hasalone-Eve, with her permission. Angstrom Mineral Information & Reference Guide; Dr. Hasalone-Eve, 8½ x 11, 203 p.
Off Balance; Dr. Hasalone-Eve, 8½ x 11, 93 p.
© Copyright 2004 – Dr. Annette Hasalone-Eve & Kornax Enterprises, L.L.C.